1) Preheat the oven to 150C/130C (Fan)/Gas 2 and line a baking tray with shallow sides (approx. 25 x 36cm) with baking paper. 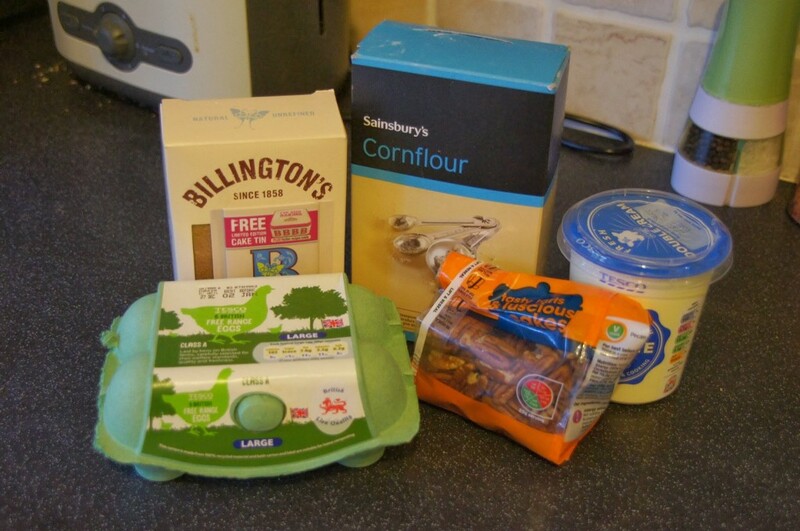 2) Put the egg whites in a clean bowl and add the cornflour. 3) Place the light muscovado sugar in a bowl and using a fork check there aren’t any lumps. Chop the pecans ready to add to the meringue later. 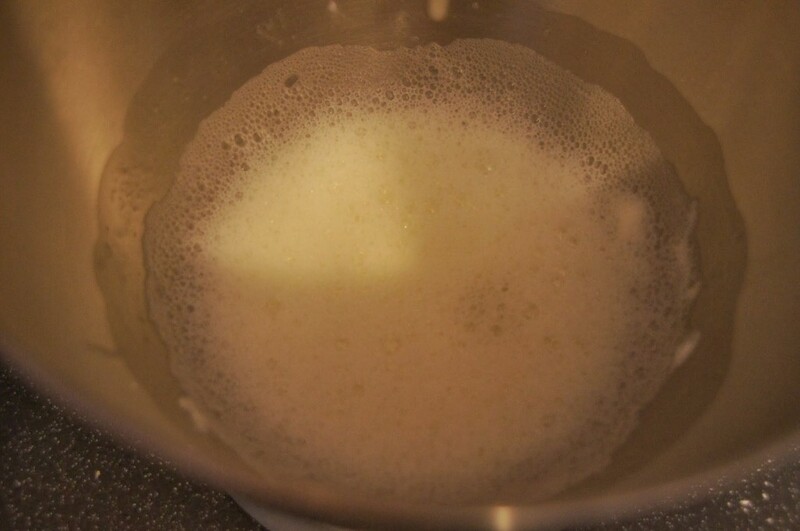 4) Begin to whisk the egg whites until they start to look foamy. 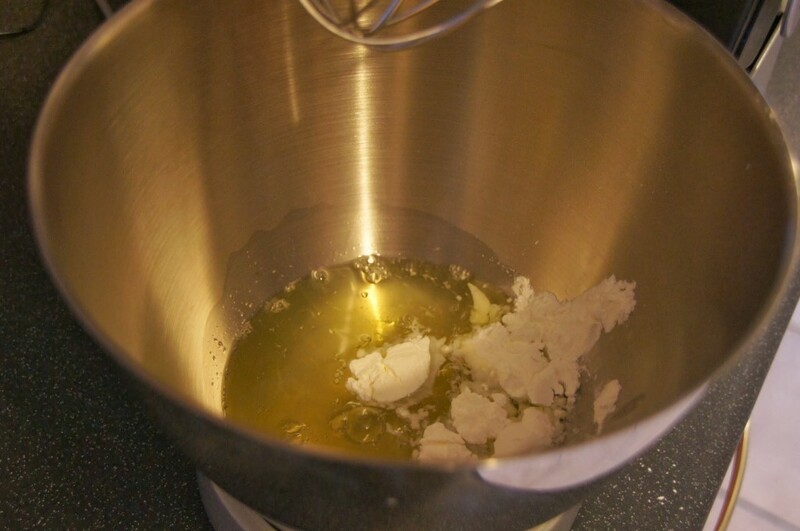 Once they reach this stage keep whisking whilst adding the sugar one spoonful at a time until it is fully incorporated. 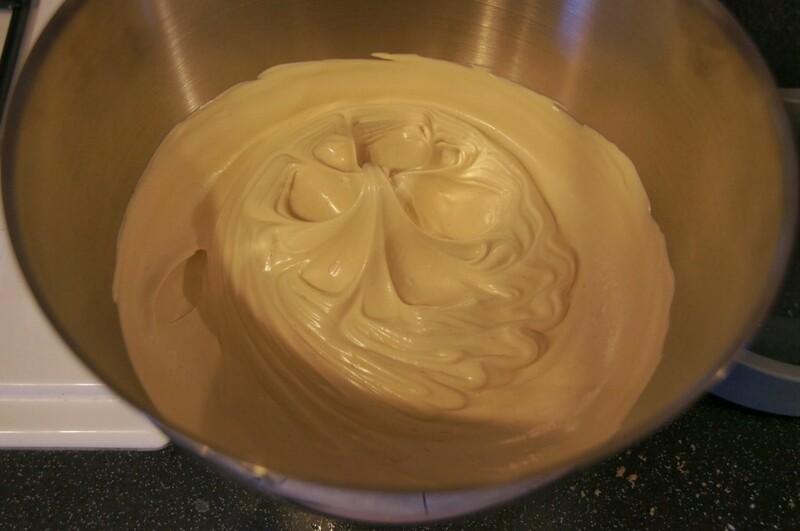 5) Keep whisking until the meringue is firm (you will need to be patient!) and you could hold it over your head without it falling out! 6) Gently fold the pecans into the meringue, until they are just worked through. 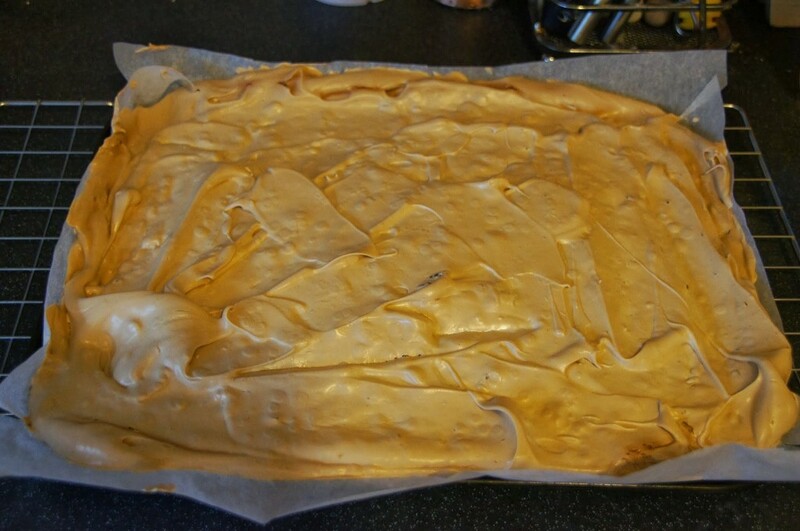 7) Spoon the meringue onto the lined tray and gently spread it out using a palette knife or spatula. Make sure it reached to all of the corners and is fairly flat (this is where I went wrong). 8) Bake it in the oven for 1 hour – 1 1/2 hours. You will need to keep checking it. It should not be sticky to the touch but should feel slightly squidgy. Once cooked take it out of the oven and leave it in its tin to cool completely. 9) Whilst the meringue is cooling prepare your filling. Whip the double cream with two tablespoons of icing sugar until it reaches soft peaks. Put the caramel in a bowl and beat it with a spoon to loosen it. 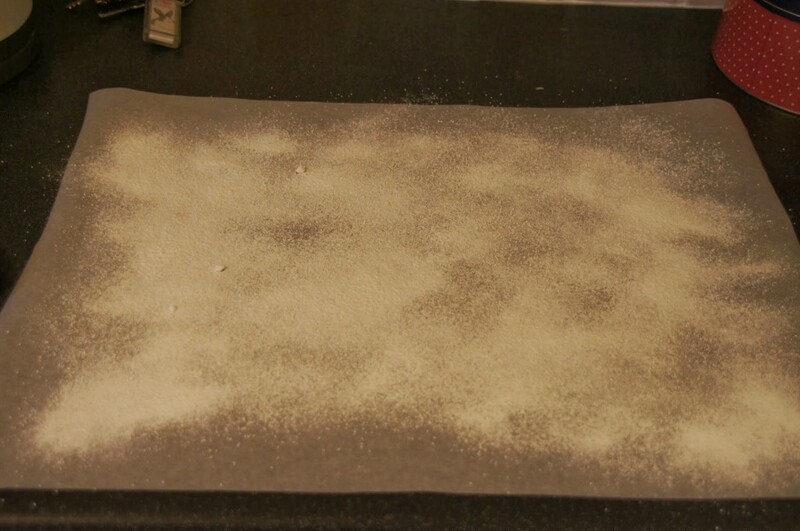 10) Set out a large piece of baking paper on your work surface and liberally dust it with icing sugar. 11) Flip the cooled meringue onto the paper and carefully release the paper around the edges before peeling it away completely. 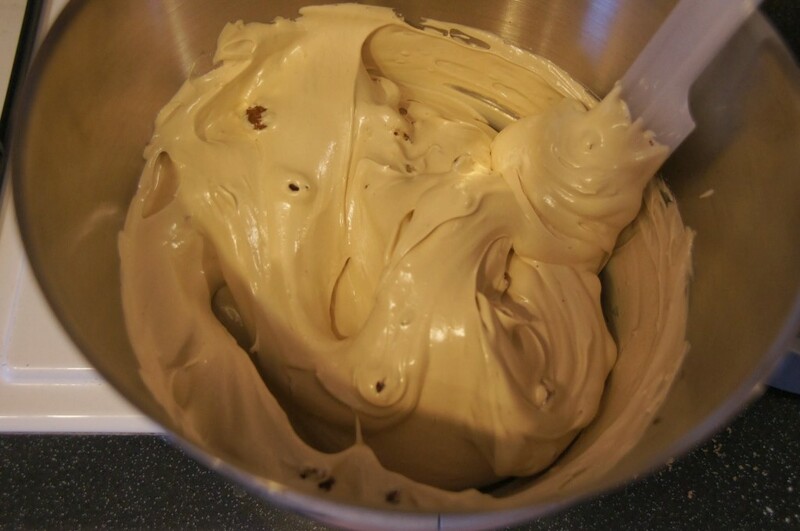 12) Spread the surface with the caramel followed be the whipped cream. 13) With a sharp knife cut through the meringue 2cm in from one end, all the way along. Fold this directly over the rest of the meringue. 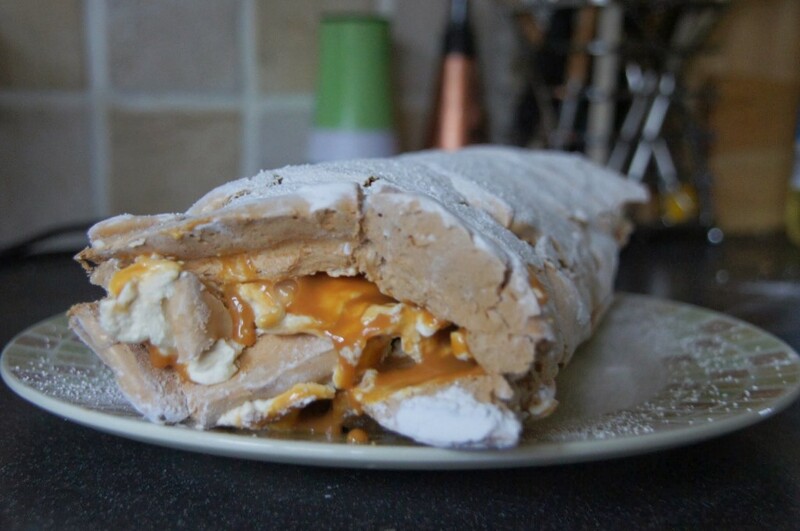 Take the edge of your baking paper and lift it to start rolling your roulade. Keep rolling it until you get to the end. 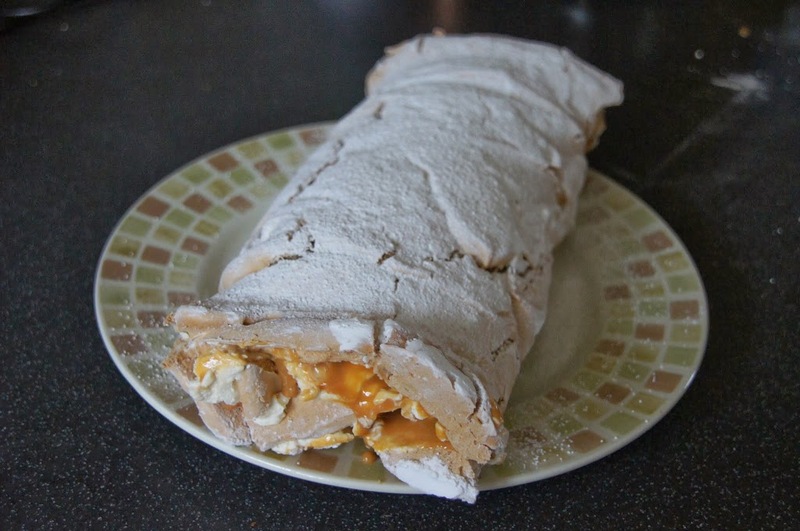 14) Turn the roulade so that the seam is underneath and dust with icing sugar ready to serve.